On our arrival this morning, after overnight rain, we had our best 'fall' of migrants this autumn. Warblers were mainly in the Paddock, at Hope Point and in the Freedown and numbered five Reed Warblers, 29 Lesser Whitethroats, 18 Whitethroats, 46 Blackcaps, a Garden Warbler, nine Chiffchaffs and 23 Willow Warblers. There were also singles of Spotted and Pied Flycatcher, four Wheatears, two Whinchats, four Common Redstarts, three Goldcrests and a Short-Eared Owl. Flyovers included eight Golden Plovers, singles of Dotterel and Dunlin, four Little Egrets in off the sea, a Honey Buzzard moving North and singles of Grey and Yellow Wagtail. Over the big field there were up to 50 Swallows feeding and, in the field, a flock of 350 Herring Gulls. Hard work this morning for little reward, very few warblers and only four Wheatears in the fields. 6.30-11.30 A good arrival of Blackcaps had occurred since my last visit with at least 49 recorded mostly at Hope Point. Apart from these, warbler numbers remain low with eight Reed Warblers, a Sedge Warbler, five Willow Warblers, a Chiffchaff, 16 Whitethroats and nine Lesser Whitethroats. A single Whinchat and two Wheatears were along the cliff top fence and a Short-eared owl put in a brief appearance at Hope Point. A Tree Pipit came in off the sea at Hope Point as did a flock of 14 Starlings. 7.30- 12.00 Still very low numbers of warblers with only 2 Willows, 2 Reed Warblers, 17 Whitethroats, 8 Lesser Whitethroats and 7 Blackcaps. A single Whinchat appeared briefly on the cliff top and three Golden Plovers spent over an hour in the Big Field until disturbed by dog walkers. The Turtle Dove was again singing at Hope Point and there was a Black Redstart at Hope Bay Studios in the same place where Nigel and Brendan saw one a few weeks ago, possibly a local breeder? On the rough I had 12 warblers of six species, most notable were two Garden Warblers, and around the fields were 16 Wheatears and nine Yellow Wagtails. Also had a Golden Plover fly over. With a light NW blowing Phil and I found a few things moving this morning. There were 45 Swallows, 20 Swifts, six Yellow Wagtails and four Buzzards going NW whilst two Hobbys and two Great Spotted Woodpeckers came in off the sea. Around the area we had two Reed Warblers, 10 Whitethroats, four Lesser Whitethroats, one Chiffchaff, three Willow Warblers and 12 Wheatears our first double figure count of the autumn. Phil and I walked the fields today and had nothing but three Wheatears, two Ravens and a flock of mixed Gulls. We did however find both sorts of Fluellen, round leaved and pointed leaved. We also tried seawatching until we were drenched by an amazingly heavy shower. More warblers today with 26 Whitethroats, 12 Lesser Whitethroats, a Garden Warbler, three Blackcaps, three Chiffchaffs and seven Willow Warblers. Around the fields were 56 Skylarks, 600 Starlings and overhead a grey Heron, Cuckoo, Marsh Harrier, three Tree Pipits, nine Yellow Wagtails, six Pied Wagtails and five Wheatears all flying SW.
Far fewer birds today of which most notable were four Wheatears, a Whinchat, Spotted Flycatcher, Golden Plover and 50 Skylarks in the stubble field. Warbler totals were two Reed Warblers, four Blackcaps, 25 Whitethroats, seven Lesser Whitethroats, a Chiffchaff and two Willow Warblers. Other than that we had a Hobby, 30 Mediterranean Gulls and the pair of Ravens. Far fewer warblers today with three Reed Warblers, one Garden Warbler, 24 Whitethroats, three Lesser Whitethroats, four Chiffchaffs and 10 Willow Warblers. The two Turtle Doves and Wheatears were still present and on the rocks there were 850 Black-headed Gulls. In the fields there was a third winter Yellow-legged Gull and a single Tree Pipit flew over the cliff-top. The first Autumn Lady's Tresses are about to flower on the lawn of Little Green on the Leas at Kingsdown. Phil and I walked the area this morning and had presumably the same Turtle Dove singing at Hope Point, two Wheatears, 14 Reed Warblers, six Blackcaps, 58 Whitethroats, nine Lesser Whitethroats, 14 Willow Warblers, five Chiffchaffs and a Goldcrest. Phil and I met Brendan briefly before he departed after having seen upwards of eighty warblers and a singing Turtle Dove at Hope Point. We continued for another three hours and added more birds. Day totals were 11 Common Swifts, eight Yellow Wagtails, nine Wheatears, six Reed Warblers, one Sedge Warbler, three Blackcaps, 83 Whitethroats, 21 Lesser Whitethroats, 14 Willow Warblers and a family party of six Chiffchaffs, a pair and four young being fed. It was a very good day for insects with many Painted Ladies, our first big numbers of Chalkhill Blues and two Clouded Yellow Butterflies, one being of the helice form. Also around the entire area we counted 11 Hummingbird Hawkmoths. Phil and I had an hours seawatch with little reward apart from 140 Gannets, 46 Sandwich Terns and a Mediterranean Gull all moving north. There was also a Spotted Flycatcher in off the sea and two Harbour Porpoises feeding in the Bay. Phil walked the fields today for three and a half hours and found two Whimbrels, 13 Yellow Wagtails, a flock of 450 Starlings, five Lesser Whitethroats, 12 Common Whitethroats, three Chiffchaffs and eight Willow Warblers. There were also14 Migrant Hawker Dragonflies. Much the same numbers of warblers as yesterday with two Reed Warblers, two Blackcaps, a Garden Warbler, nine Lesser Whitethroats, 26 Common Whitethroats, a Chiffchaff and 11 Willow Warblers. Other birds included two Wheatears, three Yellow Wagtails, five Bullfinches and a flyover Crossbill. Phil and Jack walked the area this morning and still had reasonable numbers of birds with one Whinchat, two Wheatears, five Reed Warblers, 11 Lesser Whitethroats, 20 Whitethroats, four Chiffchaffs and 19 Willow Warblers. Also of note were 70 plus Skylarks in the stubble field. I had a family trip out to the Goodwin Sands this morning with Dover Sea Safaris. Leaving Dover at 05.00, on the sands for about an hour just after 06.00. A weird and wonderful experience. I didn't expect them to be so uneven, full of channels and pools, not a low flat sandbank as they look when viewed through a scope from the cliff top. Neither did I expect so much wildlife. We knew there were seals but I estimated 250-300 Grey Seals and plenty of birds as well. Highlights were three Little Terns, a Marsh Harrier heading towards Kent, a Tufted Duck (a scarce bird in The Channel for us), a Knot, a Sanderling, seven Dunlins, 80 Sandwich Terns, 50 Common Terns, 60 Gannets, a Kittiwake and five Common Scoters. My Uncle, Phil Heading, has kindly provided the images below which capture some of the beauty of this wild landscape. He even has a distant shot of Bockhill. Spot The Monument! Another reasonable day of warblers with 4 Reed Warblers, 1 Sedge Warbler, 1 Grasshopper Warbler, 3 Blackcaps, 19 Lesser Whitethroats, 31 Common Whitethroats and 32 Willow Warblers. Nigel, Brendan, Phil and I did the entire area during the morning and had over 150 warblers of 8 different species, they were mostly Common and Lesser Whitethroats, Blackcaps and Willow Warblers. We also had a Grasshopper Warbler, our first of the autumn, a Black Redstart, Wheatear and 2 Whinchats. Flyovers included Golden Plover, Whimbrel, Curlew, Lapwing, 2 Crossbills, 5 Bullfinches, 5 Yellow Wagtails, a Red Kite and c. 500 feeding Swifts. Most notable insects today were 6 Hummingbird Hawkmoths. Phil and Jack were out early walking the cliff top at Bockhill in a strong SW. I joined them at about 09.30 for a couple of hours. It was quiet, four Ravens, a Wheatear, five Whitethroats a Lesser Whitethroat, 13 Swifts and a Hobby over Kingsdown. 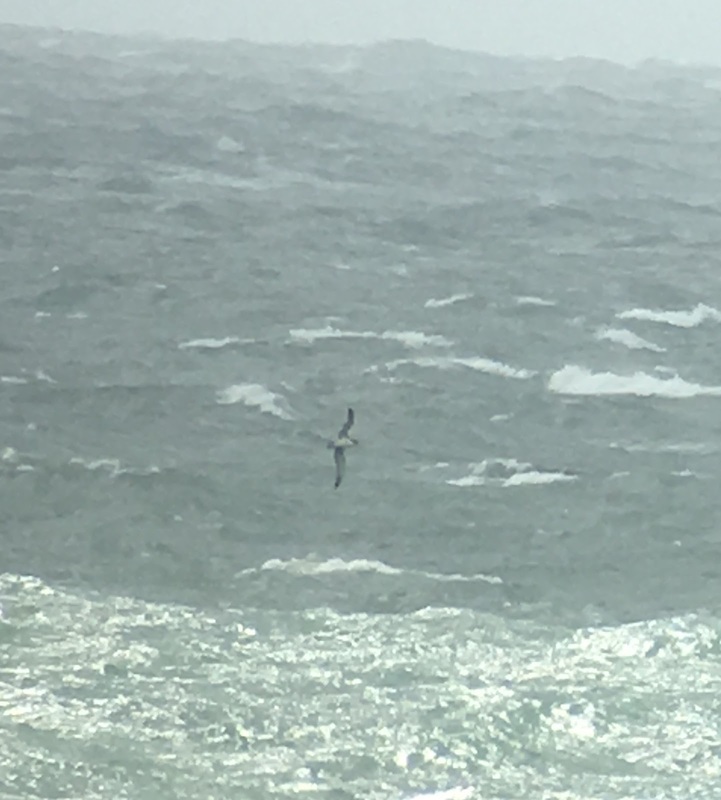 Phil, Richard and I did a seawatch from 08:40 to 14:40 (a long time for us), in an increasingly strong SW gale and had 2 Common Scoters, 6 Manx Shearwaters, 2 Shags, 5 Dunlins, 3 Arctic Skuas, 37 Black-headed Gulls, 3 Mediterranean Gulls, 194 Kittiwakes, 16 Sandwich Terns, 19 'Commic Terns', 20 Common Terns, 3 Arctic Terns, 3 Auk sps. and 35 Swifts. Later in the afternoon there were 120 Swallows and 6 Yellow Wagtails in the Paddock. I know it's hardly award winning but a bit of practice so we don't mess up the Fea's Petrel. 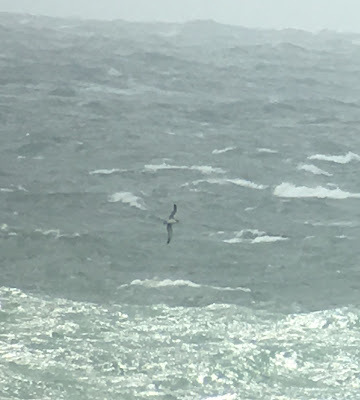 Phil and I did a seawatch for an hour and half in the morning but had very little of note apart from a very close Manx Shearwater moving SW...... those rare elusive terns seem to stay on the other side of the Channel. Brendan, Phil and I had a good day for warblers with a total of 105, consisting of 3 Sedge Warblers, 2 Reed Warblers, 16 Lesser Whitethroats, 50 Whitethroats, 5 Blackcaps, 2 Chiffchaffs and 27 Willow Warblers. Also had the juvenile Whinchat that has been around for four days, a Red Kite hunting across the fields and four Ravens 'cronking' along the cliff-top.